When it comes to selecting a satellite phone there are really only three choices. 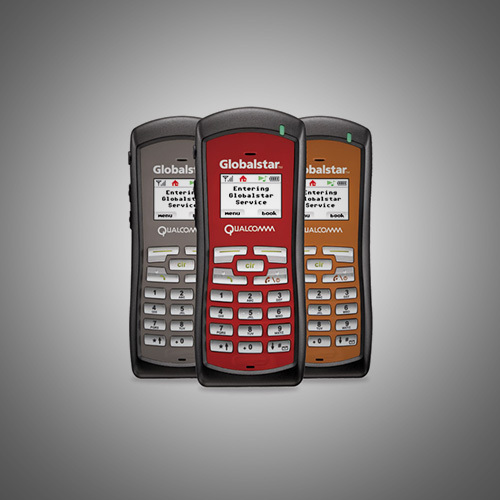 Those choices are Globalstar GSP 1700 phone, Inmarsat IsatPhone 2, or three versions of Iridium satellite phones, Iridium 9555, Extreme 9575 or the Extreme 9575PTT. All these phones will provide basic telephone calling capabilities, but each offers different advantages, disadvantages, features and coverage areas. The Iridium 9555 is the Iridium base model phone. The phone offers inbound and outbound calling, text messaging and voicemail service. The phone comes with a complete suite of accessories including car charger, wall chargers, leather carrying case and external antenna. This is the lowest cost of the Iridium phones. 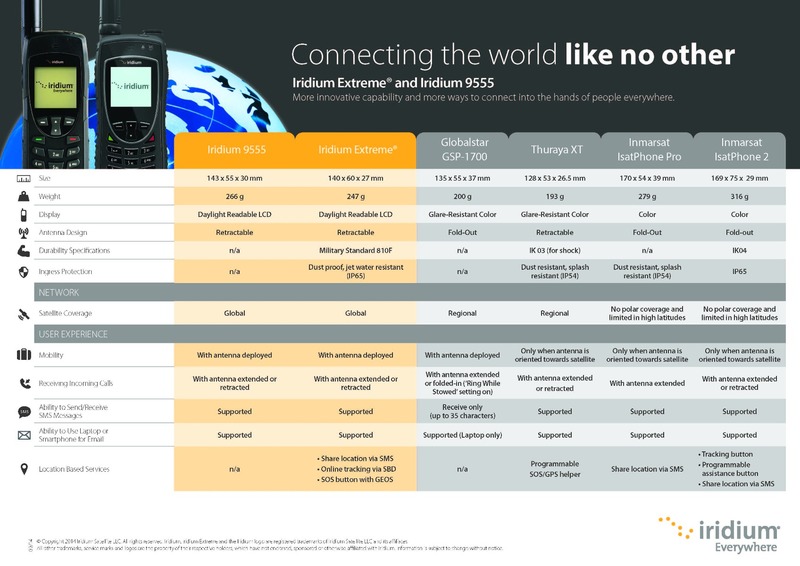 The Iridium Extreme 9575 offers all of the same features as the 9555, and is ruggedized, water resistant, and GPS enabled. The phone offers inbound and outbound calling and text messaging along with voicemail service. Because it is GPS enabled it allows you to send position reports, it can function as a self-reporting tracking device and has a built in SOS button that will summon help. 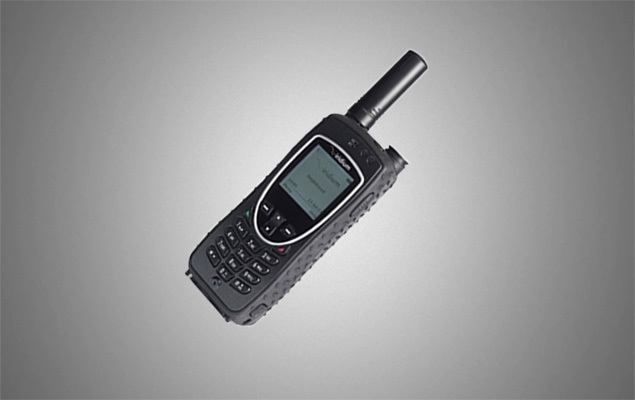 The Iridium extreme 9575 Push-To-Talk phone is a dual mode satellite phone. It is also ruggedized, water resistant, and GPS enabled. In phone mode it functions identically to the standard 9575 model, making and receiving phone calls, text messages, voicemail and tracking. Switching to PTT mode the phone functions like a standard PTT radio. When you key the microphone and are talking, all of the other Iridium PTT’s in your group are able to hear and respond. Because the system is satellite-based there’s no limit to how far away the other radios can be. They can literally be located anywhere on the planet. All Iridium satellite phones can be provisioned with pre-paid airtime with varying amounts of minutes, or monthly subscription accounts that can also include monthly minutes in the cost. Iridium PTT phones offer unlimited talk time for a single monthly fee when the phone is in PTT mode as well as provisioning with a monthly account for when the phone is in phone mode. The Iridium Satellite Constellation consists of 66 low earth orbit satellites that form a net over the entire planet. The Iridium network will work anywhere on the globe. Because the satellite’s orbit close to the earth there is very little delay in the signal. And because the satellites are constantly orbiting if you happen to be between buildings or in a canyon where your satellite phone cannot see a satellite at that moment, a satellite will eventually pass overhead giving you a signal. With a clear view of the sky the Iridium network is extremely reliable with minimal drops or outages. 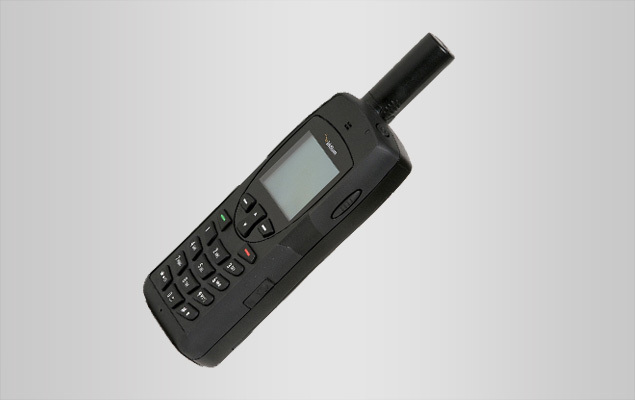 The IsatPhone 2 is a lightweight satellite phone provisioned on the Inmarsat satellite network. The phone is ruggedized, water resistant and GPS enabled. The phone offers out bound and inbound calling and text messaging along with voicemail service. Because it is GPS enabled it allows you to send position reports, it can function as a tracking device and has a built in SOS button that will summon help. The IsatPhone 2 has a unique Inmarsat satellite phone number that requires inbound callers be able to dial an international number to reach the phone. Inmarsat does not offer a U.S. phone number as an option. The phone is Bluetooth enable to allow for hands free operation. 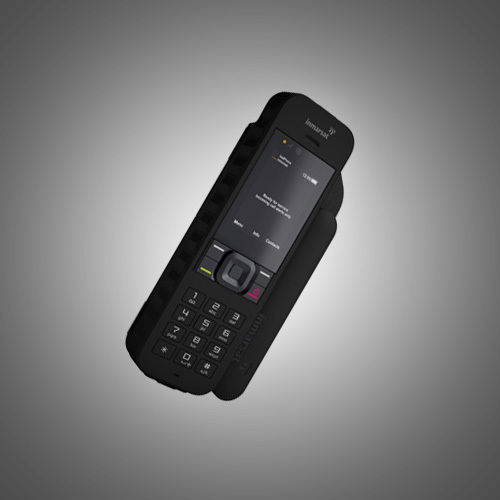 It advertises the best battery life of any of the satellite phones with 8 hours of talk time and 160 hours of standby. The phone is moderately priced and both pre-paid and monthly airtime plans are available at reasonable rates. The Inmarsat Satellite Network consists of three geosynchronous satellites spaced equidistance around the globe in a fixed position over the equator. The satellite are 22,000 miles above the earth, allowing the three satellites to cover about 80% of the planet. Because of the height of the satellites there’s a bit more delay in the signal than with other satellite phones and it also takes longer for the phone to acquire the satellite. Because the satellite is in a fixed position, and the phone must be able to see the satellite to get a signal, if you have a mountain, buildings or some other obstruction blocking the satellite you will not get a signal unless you relocate. Inmarsat voice network is extremely reliable with minimal drops or outages. Globalstar GSP 1700 is a small lightweight satellite phones that is provisioned on the Globalstar satellite network. 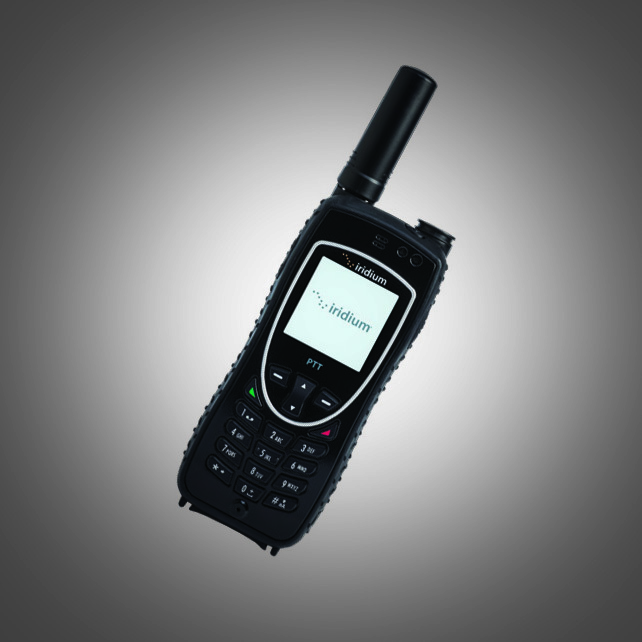 It offers basic calling capabilities and voicemail, with the best call quality of any of the satellite phones. It has the ability to receive, but not send text messaging. It has good battery life, with 4 hours of talk time and 36 hours of stand by on a single charge. All Globalstar phones are assigned a standard U.S. phone number. This makes inbound calling to the phone simpler. Currently, Globalstar is no longer making satellite phones, nor have they indicated any future plans to start making new phones, so any phones that are being sold are refurbished or used phones. For this reason, Globalstar offers major incentives to buyers along with the lowest airtime rates of any of the satellite phones. The Globalstar Network is a constellation of low earth orbit satellites that provides regionalized coverage over major populated areas. It is considered to be the least reliable of the three networks, meaning more frequent dropped calls and periods of not being able to get a signal at all. In addition to the satellite phones reviewed in this document, you can also make satellite phone calls using your cell phone paired to devices known to as satellite hotspots. Satellite hotspots are covered under a separate topic found on this web site.